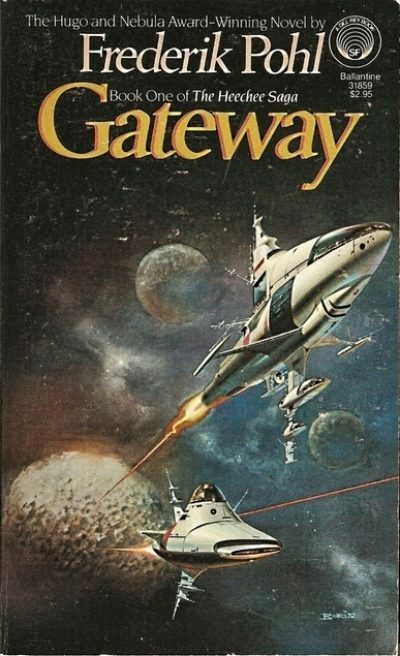 1977’s Gateway is the first novel in Frederik Pohl’s Heechee series. Robinette Broadhead has wealth and status, so why is he so miserable? The answer lies in the past, in the source of Broadhead’s money: the alien starport humans call Gateway. Broadhead was born into poverty and seemingly destined to spend his life working in Wyoming’s shale mines. It’s important work — 10% of the world’s twenty-five billion depend on food grown from Wyoming’s hydrocarbons — but it’s not work that pays well. If not for a lucky lottery win, Broadhead could have looked forward to years spent underground until the inevitable day a mishap or health crisis ended his expendable life. Winning the lottery meant Broadhead had choices. He chose to spend his quarter million on a ticket to Gateway. Discovered twenty years earlier, Gateway is a half-million-year-old alien artifact, a converted asteroid with nearly a thousand starships inside it. Despite their age, many of the starships still work. Sufficiently brave or desperate volunteers have been boarding the ships to see where the ships take them. Since humans have no idea how the ships work, attempts to modify them often end badly. Attempts to use the ships in their original state often end badly. There is no known way to predict whether a given trip will take two weeks or two years. Many of the destinations are dangerous. Some are immediately lethal. Many prospectors venture out to the stars. Many die of starvation, infection, radiation, and worse. Some come home having found nothing of interest. The tiny handful who return with something valuable are lavishly rewarded. The hope to be one of the lucky few keeps the majority on task. It also provides an incentive to invest small fortunes in travelling to Gateway. Having reached Gateway, Robinette makes a terrible discovery: wealth beyond his dreams could be his, but he is afraid to take advantage of the opportunity. He dallies. Eventually, however, he has no choice but to head out to the stars, where he will win his fortune… at a terrible cost. For years I thought this was a John Berkey cover. It’s a Boris Vallejo. Still, even if Pohl had not been on my Always Buy list, a cover that looked like it might be a Berkey would have convinced me to pick it up. Gateway won the Campbell Memorial, the Hugo, the Nebula, the 1979 Prix Apollo, and came first in the appropriate category for the Locus Award. Pretty good for a guy who had been active in the SF field for thirty-seven years, an elder figure who was still somehow managing to be relevant despite being … about a year younger than I am now when he wrote Gateway. Hmmm. I remember so clearly being impressed when I was sixteen that he managed to be creative despite advanced age. I suspect programmers and therapists will find portions of this novel delightfully archaic, while rocket scientists will find Pohl’s faith in the potential of chemical rockets a bit eyebrow raising. Some may find the implicit population bomb elements outdated. Still, there is one aspect of this book that is very timely. Which is the complete and utter lack of empathy society feels towards its members. It’s not at all clear from the evidence presented in this book why the Heechee made the design choices they did, but they’re alien and also not around to ask. One has to assume those choices made sense at the time. The choices the humans make also make sense, given the implicit assumption that human life has almost no value. The most dramatic demonstration of this is the medical system, which would delight the most malevolent Republican. The extremely rich have Full Medical, which will keep them youthful and healthy for most of their lives. The merely rich have Major Medical, which will cover most medical issues. The rabble are welcome to die as soon as the first catastrophic health issue comes along. They are also allowed to sell off body parts to their betters. 74 vessels returned from launches during this period, with a total crew of 216. 20 additional vessels were judged lost, with a total crew of 54. In addition 19 crew members were killed or died of injuries, although the vessels returned. Personnel grounded or exiting Gateway in period: 151. Lost operationally: 75 (including 2 lost in lander exercises). Medically unfit at end of year: 84. Total losses: 310. New personnel arriving in period: 415. Returned to duty: 66. Total increment during period: 481. Net gain in personnel: 171. But it doesn’t matter. No matter how many prospectors die, there are always more where those came from. Robinette spends his days wracked with guilt over what he did on his last mission, the act that inspired Gateway to hand him millions of dollars. The details of Pohl’s world-building make it clear, however, that treating other people as expendables isn’t just something bad people do. It’s the basis of the setting. Anyone who does anything but look out for Number One is a chump, likely to die young. The most miserable people in Gateway are the people who insist on seeing other people as people rather than as stepping stones to success. Broadhead feels guilty about the monumental act of betrayal that capped his career, but he never uses any of the wealth that rewarded it to try to better his world. In fact, there’s no evidence anyone in this setting can imagine a better way of doing things. The essential first step of reform, imagining it, seems to have been made impossible. It’s an unpleasant world, but all too plausible. Gateway is available here (Amazon) and here (Chapters-Indigo). In the immediate sequel, Broadhead and his wife are embarking on ventures to try to better their world. Any idea why this isn't available in ebook format? I checked the reviews on Amazon. It looks like there was an ebook version, but it was so poorly done they withdrew it. This is a classic case of "pretend there were never any sequels". It's brilliant and they're at best mediocre.